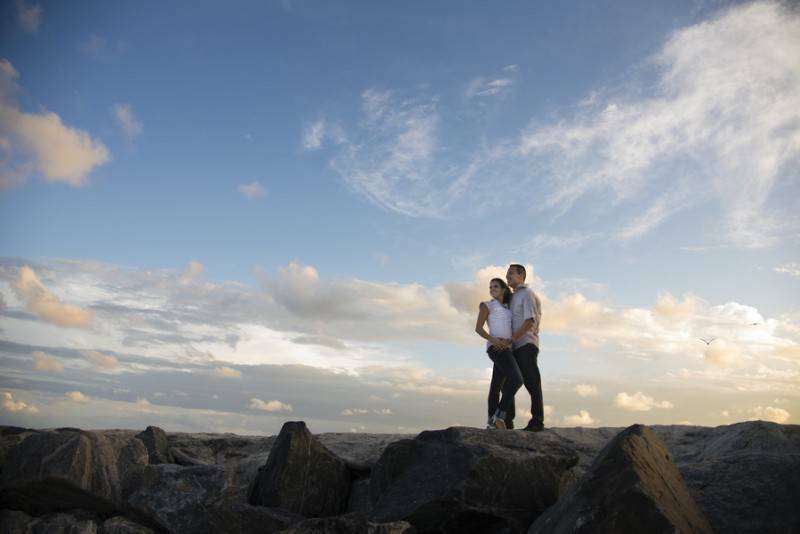 Jackie and Juan showed a different kind of romance for their engagement session. Its obvious that they had fun. You can clearly see that they had a lot of it the entire day because the two were all giggles and smiles in the photos. Don’t get too hang up on getting that perfect romantic pose. 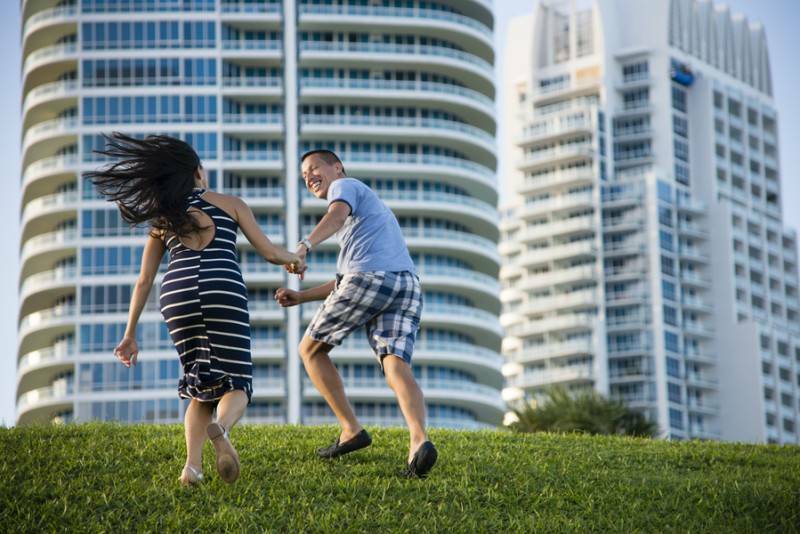 Having candid fun is just as good a photo. It showed how much they truly adore one another. The photographer even caught them got soaked in the beach. So cute! Jackie & Juan wanted to display their fun personalities. I was trying to get some romantic shots, and them kept on breaking out with jokes and laughter, so I was glad I was able to get a mix of both. 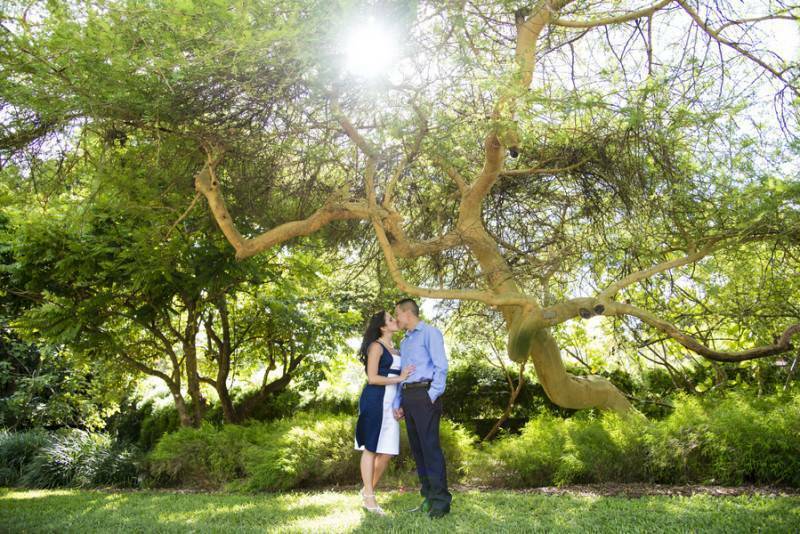 The first location– Fairchild Tropical Botanic Gardens they wanted a romantic garden feel with more dressy clothes. 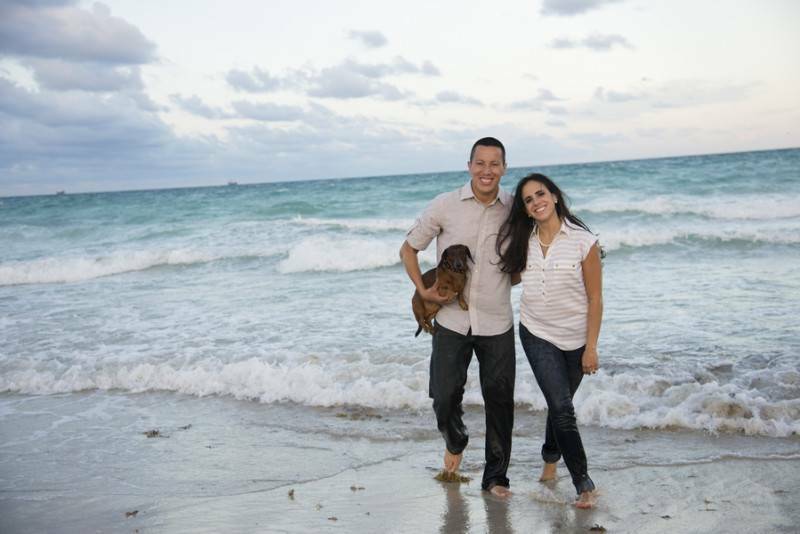 The second location we traveled to South Pointe Park in Miami Beach because they loved the buildings in the background and the rocks on the beach. 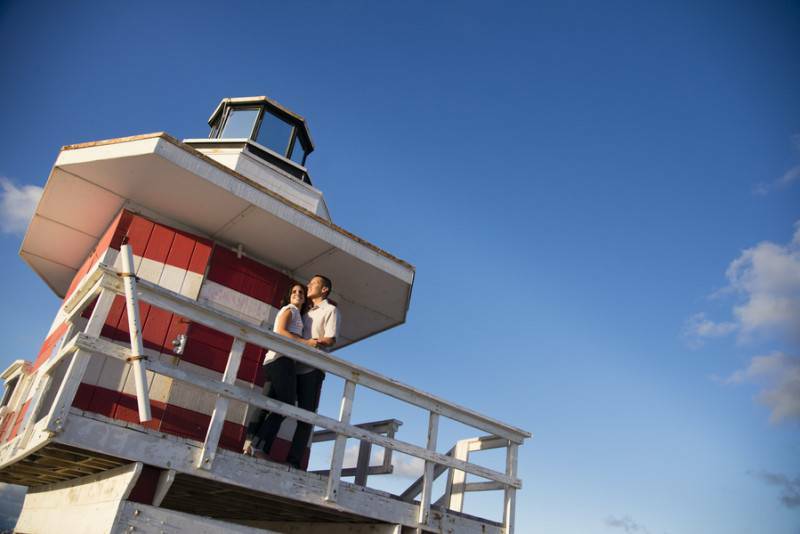 The beach and anything to do with water is imperative to them because one of their main hobbies are kayaking and living near the ocean is a top priority. They even take their dog kayaking (their dog is also a part of their engagement photos), and he loves the beach just as much! The first outfit is a beautiful romantic cocktail-dressy look. The second outfit is more their personality, just dress up in jeans and t-shirt and out to the beach. Do the photos give a hint of what will happen on their wedding day? How so? their wedding day was at a hotel and ballroom. It was easy to photograph them because they have a very very natural laugh, and them love to laugh together, much more than any couple I have ever shot. They made my job very easy! The wedding started off with doing their getting ready/first look/bridal party portraits at the Mandarin Oriental hotel, and then the ceremony and reception were indoor at La Jolla Ballroom. It was a smaller wedding (around 60 people) but they knew how to party. Their reception had a la hora loca, where there were bongo players, dancers, and even a stilts-man.